For Immediate Release: Discovery Station at Hagerstown, Inc. is pleased to announce that it was one of 250 museums around the country that was awarded Explore Science: Earth & Space toolkits to hold hands-on Earth & space events onsite between March and May for children ages 7 to 12. 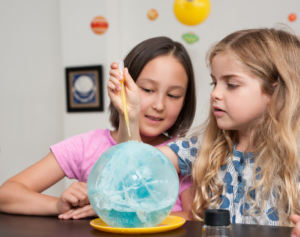 The Explore Science: Earth & Space events at Discovery Station at Hagerstown, Inc. are part of a nationwide celebration of educational programs designed to engage audiences in the awe-inspiring fields of Earth and space science. These exciting events provide an opportunity to connect with current NASA science research and explore Earth and space phenomena. The Explore Science: Earth & Space events will include exciting science activities and engaging discussion about science and society. Participants will have a chance to launch stomp rockets, explore how water moves in a watershed, make and investigate craters, and much more! The Explore Science: Earth & Space project is led by the Science Museum of Minnesota, in collaboration with the National Aeronautics and Space Administration (NASA). Explore Science: Earth & Space toolkits are developed and distributed nationwide by the National Informal STEM Education Network (NISE Net). Throughout spring and summer of 2018, events are taking place at over 250 museums and institutions throughout the country. Discovery Station at Hagerstown, Inc. is a hands-on museum that provides life-long learning experiences to thousands of children and families each year. We create an environment that stimulates curiosity for discovery, exploration, and further investigation through exhibits and programs that focus on Science, Technology, Engineering, Art, and Math (STEAM) principles. For more information about Discovery Station, see www.discoverystation.org. Contact: info@discoverystation.org, or call 301-790-0076.